1. 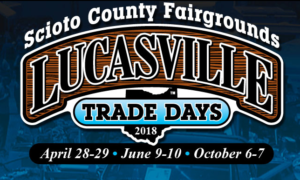 This show will be open to all Scioto County residents and adjacent counties granting Scioto County same privileges to Scioto County and exhibitors. Exhibitors limited to fifty total entries per exhibitor. 2. All entries must be made and entry fees paid to the superintendent of this department two weeks in advance of opening date of Fair for cooping arrangements. Address entries including remittance to: Karen Crabtree, 315 Conley Rd, McDermott, Ohio 45652. 3. All poultry to be inspected and approved by Fair Veterinarian, diseased poultry excluded. All birds becoming sick during the exhibition shall be removed from the show by the authority of the superintendent. 4. All birds should be leg banded. 5. Judging will be by comparison and the latest standard of perfection shall be followed in making awards. 6. Young birds cannot compete with old and vice versa, except in champions of breeds. Old birds, hatched previous years; young birds hatched year of Fair. 7. When no competition exists the judge shall make such awards as the exhibition may merit, no unworthy exhibit to win first place, will be placed second if no competition. Competition means two or more exhibitors. 8. All birds must be cooped by 12:00 noon Monday of week Fair opens. Judging starts before or promptly at, 10:00 a.m. Tuesday. Only designated officials permitted in aisles during judging. 9. Exhibits may be removed from building only after 12:00 midnight Saturday of Fair, and must be checked out through the superintendent or authorized assistant. 10. The Scioto County Fair Board reserves the right to limit the number of entries to the capacity of the poultry building but shall not exceed 50 entries per exhibit. 11. When entry fees are paid by check the Fair Board shall have the right to withhold payment of premiums until the exhibitor’s check is honored by exhibitor’s bank. if check is not valid, entry fees will be considered unpaid and all premiums will be declared forfeited to the Fair Board. 12. Championship Classes – There must be 8 or more entries in a class to compete for champion. 13. Entry fee is 20 cents for each bird exhibited. Awards for all regular classes: 1st – $2.00 and 2nd – $1.50, First and Second place ribbons will also be awarded. 14. Every precaution will be used in handling and caring for birds to avoid error or loss, but in the event of birds going astray the Fair Board will not be liable therefore. 16. All premiums for an exhibitor that total less than $10.00 will be paid in cash at the time the exhibits are released. The exhibitor must sign a voucher stating that they have received payment. Premiums of $10.00 or more will be paid by check, but must be picked up at the time exhibits are released. No premiums will be mailed to anyone after the fair. Premiums not picked up at the time of dismissal will be considered a donation to the Society.